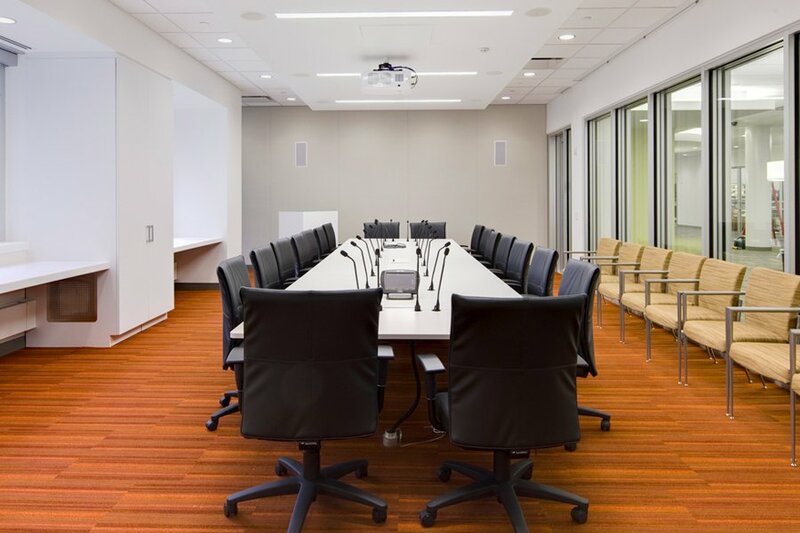 Metropolitan Acoustics was responsible for acoustical design for the new GlaxoSmithKline Radex Leadership Hub in King of Prussia, Pennsylvania. The Radex Hub takes a new approach to the office environment eliminating closed offices in favor of a combination of open offices, conference rooms, and quiet workrooms, all within one large area adjacent to a coffee shop. The concept of the Radex Hub, which contains no assigned seating, is to promote collaboration while still providing private areas to be used as needed. Metropolitan Acoustics reviewed partial height barriers and finishes in the open office areas and designed recommendations to provide appropriate speech privacy for a busy office environment. Additionally, we reviewed the partitions around the quiet workrooms and conference rooms and provided recommendations to isolate these spaces from the open office areas. The project presented unique challenges such as storefront windows at a large video-tele-conference room which requires high levels of speech privacy. We solved this difficult issue by designing a system of two side-by-side storefronts with an air space between them. In addition to reviewing the finishes and partitions, we performed a mechanical system analysis for the conference rooms, meeting rooms, open office areas, and cafeteria. Our analysis considered new and existing equipment and provided recommendations to reduce the sound in each space of interest to an appropriate level. Beyond the design phase, we were involved in construction administration, including construction site visits, to ensure that all recommendations were implemented properly.